We’d love your help. Let us know what’s wrong with this preview of After Forever Ends by Melodie Ramone. Orphaned by her mother and brushed off by her dad, fifteen year old Silvia Cotton had lived a lonely life. That is until 1985 when her father moved the family from the Highlands of Scotland to the Midlands of Wales. It is there she was enrolled in Bennington, a private boarding school, met the charming and rebellious Dickinson twins, Oliver and Alexander, and her regrettab Orphaned by her mother and brushed off by her dad, fifteen year old Silvia Cotton had lived a lonely life. That is until 1985 when her father moved the family from the Highlands of Scotland to the Midlands of Wales. It is there she was enrolled in Bennington, a private boarding school, met the charming and rebellious Dickinson twins, Oliver and Alexander, and her regrettable life was changed forever. To ask other readers questions about After Forever Ends, please sign up. how can i get the book? by email? Before everything else, I think it's only fair that I warn you, dear reader, that this book is quite long. At 3% I was already complaining how long the book was. But the further I got into the story, the more I appreciated it. At some point I wished the story wouldn't end. It's that good! Now I know the synopsis pretty much says what happens in the book. My blogger friend was wondering what the twist was but then I told her, "That's the point - there is no twist." It's true. Unlike most books, After Forever Ends isn't hinged on some game changing twist. It's so much more than that. It's about life; life made whole by love in all forms. I don't know how I finished reading After Forever Ends in 2 freaking days, but I did. Well, maybe because I can't put it down, and because Oliver and Silvia are just so adorable that I can't afford to waste my time not reading about them. Right now, I really don't know how to start this review, because of the overwhelming emotions that I feel about the story. Let's see. We'll start at the first part of it, where Silvia was with her grand daughter Kitty. I honestly didn't know where this story was headed when I was reading the first few pages, but when she Silvia started reminiscing about her life at Bennington, the story picked up and the pacing was not too fast and not too slow. Honestly, I have never cried so hard over a book like I did with After Forever Ends. The last part of it was just so heartbreakingly beautiful and very well-written that I can't stop my tears from flowing. After reading it, I was really contemplating about it. About Oliver and Silvia.. And I realized that both of them did have flaws, even if they weren't so obvious in the story because it is not the main point of it, but despite that, they loved and accepted each other wholeheartedly. In the middle of the story, I was wondering what tragic thing will happen to them, really, I was waiting, but none came. And that's the beauty of it. I have never encountered such a perfect story, with no cheating and no trust issues and no barriers and no problems. Oliver and Silvia's relationship was so perfect that I envy them, and I wanted my own Ollie in the end. Maybe some of you will be wondering, and telling me that oh, that will be a boring story, with no dilemmas along the way, but no, it isn't boring. I love the natural flow of the story, and the realness of everything that is going on with it. They married when they were 17, and at first, I was like, "What the hell?" but then it dawned on me, that yes, somewhere in this world, this can happen and it already happened to some people out there! "But more than that I wanted love. I wanted love to surround me. I wanted to swim in it. I wanted to hold it in my hand like heated sand and pour it through my fingers so it covered my feet." And I also believe that I'm a sucker for stories with twins, and in this novel, there's Alexander and Oliver, and goodness gracious, they are the most adorable twins that I have ever read about! They can kill each other when they're mad, but they can also kill just to protect each other. And ohh, I remember this one scene where their father was reprimanding them and telling them to shut up..
“Yes, Sir,” They answered in unison. Both of them quieted and slumped in their seats. I loved that Melodie Ramone showed the progress of the relationship of Silvia and Oliver. From the moment they met when they were teenagers and until their old age. I also saw the maturity in every character, especially with Alexander. I never thought that he would change his old ways, but I was wrong. He did great in the story and even exceeded my expectations. And I swear I cannot forget how they first met because I think that moment alone was already magic itself..
"I looked up and I swear time stopped. It was not that he was the most traditionally handsome boy I had ever seen, although I can’t say he wasn’t attractive. He was simply out-and-out adorable, so bloody cute he immediately made my insides wiggle. He was one of the misfits, I surmised instantly, and a popular one at that. He had a long neck from which hung a loosened black tie and the top two buttons of his white uniform shirt were undone. His dark brown hair was an intentional mess, obviously kept just short enough to meet regulations at the school. I noticed straight away he had nice skin, a smooth, olive complexion, even though I there was a small nick on his chin from having shaved. He had a straight nose, high set cheekbones, and, I glanced at his hand where he was still holding my arm, long fingers and a very gentle touch." After Forever Ends is a story of friendship, love, hope, faith, magic and death. You will really be drawn to it because of the genuineness of the characters and because the story just took its natural course. You'll laugh, you'll sigh, you'll cry and you'll learn. Learn to accept that there's nothing permanent in this world. That even though people come and go, some will always have a place in our hearts, even after forever ends. "Being lovesick can make you truly ill."
"I am talking about love in its purest form, love that happens before either person has ever been hurt by love." "Whatever it was we were in, we were into it together. Partners from start to finish, we were hand in hand. Always. Whatever it was, hard or simple, we dug into it together and we saw it through to the end." "Never allow anybody to take your heart for granted.."
"But more than that I wanted love. I wanted love to surround me. I wanted to swim in it. I wanted to hold it in my hand like heated sand and pour it through my fingers so it covered my feet. I wanted to taste it, I wanted to smell it. I wanted to wrap myself up in it like a blanket and stay safe and warm inside of it forever. And I wanted to give it. I wanted to drown people in it. I wanted to love with all my heart and be loved just as much in return." "We had heaven in each other." This was one of those stories that come into your life for a short time, but leave a profound effect on your soul. Melodie Ramone's AFTER FOREVER ENDS traces the lives of four young people from their early days at Benington, a private school, where they fight for love and honour. It is about their rites of passage to university, marriage and parenthood. The story then accelerates, much as life seems to, and takes us to some extraordinarily moving chapters as the quartet move into old age. It is w This was one of those stories that come into your life for a short time, but leave a profound effect on your soul. Melodie Ramone's AFTER FOREVER ENDS traces the lives of four young people from their early days at Benington, a private school, where they fight for love and honour. It is about their rites of passage to university, marriage and parenthood. The story then accelerates, much as life seems to, and takes us to some extraordinarily moving chapters as the quartet move into old age. It is without doubt the most emotionally evocative book I have read in many a year, possibly ever. I grew to love Silvia and her sister, Lucy, and the twins they marry, Oliver and Alexander. Their lives felt real to me and came to matter to me, as did those of their children and friends. The story is almost a model for a good life lived well and to the full. Most of us will recognise aspects of our own lives in AFTER FOREVER ENDS. Some of us may learn essential insights from the story. It may help us to make sense of our own unsolved issues. There is one pivotal scene about two thirds of the way through the book when Silvia and Lucy throw a napkin back and forth at each other during a row, as Lucy shows Silvia just how things were regarding their father, with whom Silvia has had a difficult relationship. I found this profoundly moving as things were not easy between myself and my own father. I am sure others with find things in this road map for a life lived well that may have meaning for their lives. The story and the characters in it are V for Vigorous. "Nothing bothers me more in this world than a person who behaves as a sheep and not as a dragon", says the elderly Sil in the absorbing first chapter. "My problem is that I am homesick," she says, setting the scene for what is to follow, "I miss my little house in Wales." I was hooked by the notion of an old woman remembering and craving to get back to what she loved, as this is something that many of us may feel as we age, esp if our lives have been well lived. So, too, Silvia's hankering after a special place is common to many of us. Indeed, AFTER FOREVER ENDS is definitively a story of place and belonging. In these times of shift and impermanance, it shows strongly how spiritually sustaining a sense of place and belonging is. There is a great lesson here for us all. So, too, many will find lessons in the way Silvia, a feisty and intelligent woman, surrenders her career to the cause of her and her brother-in-law's 'muffins'. No story better portrays the absolute joy of motherhood than this one. It is not about gender politics and power. It is about timeless human instincts and, this is the word: joy -- the joy of motherhood. Some wld make intellectual counter-arguments, but AFTER FOREVER ENDS is not about the intellect, though it is an intelligent book. It is about fundamental emotions and instincts. I sympathise with the book on this count because such emotions and instincs are our roots and we are lessened as human beings if we ignore or deny them. Another feature running discretely through the story is a gentle feyness. The story is about trees, winds, the Welsh countryside. But it is also about deeper spirits which whom the characters commune. These spirits of the woods have a pagan feel to them, are entirely benign, and seem to link the lives of the characters to ancient times. This quote from one of the fey captures the essence of the story, "They (humans) share a magic with us called love. It's a strong magic, it comes from deep within the source of all creation. Because it is so strong within him he takes it with him when he crosses through the veil." Wales, where the story is set, is an ancient land, a bastion of ancient peoples. And Welsh is, I believe, the oldest living language in Europe. Yes, there is a magic in all this. Back to practical matters, the author has resisted the temptation to split her story into two or three smaller books. I applaud this as there is a unity to the story as it is presented which wld otherwise be lost. And I for one hate stories that have false endings clearly designed to lead into the next marketing opportunity, ach, sorry, sequel. There are at least a dozen emotional peaks in the story, moments of absolutely powerful emotional intensity. This story is not a genre thriller, far from it, the lives are very recongnisable, but it is emotionally thrilling because all the emotional peaks are things that will happen to most of us. AFTER FOREVER ENDS condenses the whole of family life, the most emotional parts into one story. The impact is totally overwhelming at times. It will trigger recollections, hopes, and fears. It is also a beautiful story because the joy the characters share feels tangible. I loved reading about their happiness as this made me feel happy and hopeful. I was intensely saddened at times also, but such is life. I read with mist in my eyes, esp the last third of the story. That said, this is not a sad story. The concluding chapter is.. Well, I will let you find out for yourself. I think someone in their early-to-mid twenties might love this book because they may take much from it because they will still be learning life. And I believe older people will enjoy it also because they may enjoy pointers of how to age well, how to make sense of their own nostalgic hankerings. They may also enjoy the memories the story is bound to trigger in them. Oh and middle-aged women esp may enjoy the vivid birthing scences as they are absolutely sure to make them remember their own experiences. And, erm, there are a couple of phwoarrr bonks in it, too. I esp enjoyed the way the twins Oliver and Alexander were drawn: "the stuff young girls dream of." They really did feel like two halves. I found the "wonderful and terrible" Alexander an absolutely fascinating study. I sometimes wished I had been like him, had his vigour. There is a Shakespearean feel to the twins. But we men are just the spear carriers in this story. It is the women and esp Silvia who is at the core of this story of Love, Life and Death. Here is what the new mum has to say of her firstborn: "She was our perfect combination, our little chocolate dipped cherry muffin .. and laughing at her parents." I cld see my own kids laughing at their parents and that laugher is one of the happiest sounds their is and you will hear ringing from the the pages of AFTER FOREVER ENDS. I'm going to start off by saying that I've never read a book that has inspired me more. It's reminded me to cherish the ones I love, and never take them for granted. It's reminded me to always believe in the magic of this world. This book filled my heart with so much love and joy, that by the end I didn't know what to do with myself cause I missed Silvia, Ollie, and Alex so much. This book is a love story. Not just between two people. It a love story about 4 people, who I 10+++++++ magical stars! This book is a love story. Not just between two people. It a love story about 4 people, who I truly believe are soul-mates, together, in the purest way possible. This story begins in the beginning. Two 15 year olds, Silvia and Ollie, meet and basically fall in love at first sight. It was a pure true love that they never gave up on, no matter what anyone said or thought. Ollie has a twin named Alex, and they are basically "one soul walking around on 4 legs". They are each others best friend, and adding Silvia to the mix as Ollie's love, didn't lessen their bond, because Alex loves Silvia just as much but in a different way. He sees her as his best friend, more than a sister. They go on with their lives, each of them overcoming the obstacles that life throws at them, but Ollie and Silvia stick together no matter what. They lean on one another, never forgetting what they have in each other. Alex also goes through heartache, but has Silvia and Ollie to turn to,and eventually, Lucy is also added to the mix (Silvia's sister). This book shows what REAL, TRUE love is. This book takes us on a journey through Ollie and Silvia's life, through the growing of their family, through old age. It was simply such a beautiful story. I laughed so hard at times that my stomach ached. The banter between these characters so hilarious at times, and it was so easy to fall in love with the twins. At one point I was crying cause I didn't want this story to end. It was that good. This story isn't about angst, or jealousy, or any of that messy stuff that tends to ruin relationships and ruin trust with one another. This book was so PURE. At one point, Alex admitted to being in love with Silvia, but not in a lustful way. Ollie knew it, and simply accepted it for what it was, and never fought against it. In fact, towards the end, Lucy admitted that Ollie and her went on dates because Ollie insisted he had to fall in love with her, the way that Alex loved Silvia. He explained that he knew Silvia was the right one for him BECAUSE Alex loved her so, because he could never marry someone that wasn't good enough for Alex. That was how close of a bond they shared. I know this may seem strange...it seems like Ollie and Alex shared Silvia....but that's not right. Ollie had her completely, her heart belonged to him. Their was just an acceptance of the bond that Alex and Silvia shared, which was very pure and close to a brother and sister kind of love...but so much more. When Lucy was finally added to the trio, it was like this small group of soul mates...that would always be there for each other and love each other so completely. By the end of the book, I wanted to go and have a slew of children just so I could experience the house full of love like this couple of couples had. This book such an amazing experience...I've never read anything like it. It was long...very long...but I found myself so enchanted with the story, with the world of faeries, and magic...I didn't want it to end. I rated it 10++++ stars because it simply was that amazing. You will get to attached to the characters, you"ll not want to stop reading. One of my favorite quotes from AFTER FOREVER ENDS is "Love is the oldest and greatest of all the magic in the world." I open up my review with this quote because Melodie Ramone's novel is absolutely magical. True love - the high, lows and in-between is captured in this remarkable novel about Oliver Dickinson and Just Silvia Cotton (you have to read it to understand this reference). After Forever Ends is not only a splendid journey of love, it's a lifetime of living set on display for all to expe One of my favorite quotes from AFTER FOREVER ENDS is "Love is the oldest and greatest of all the magic in the world." I open up my review with this quote because Melodie Ramone's novel is absolutely magical. True love - the high, lows and in-between is captured in this remarkable novel about Oliver Dickinson and Just Silvia Cotton (you have to read it to understand this reference). After Forever Ends is not only a splendid journey of love, it's a lifetime of living set on display for all to experience. How I enjoyed this book called After Forever Ends by Melodie Ramone. This is a story of love and life as we go through the days of Sylvia, Oliver and Alexander. All the ups and downs of their journey bring you back to your courtship days and family ties. Family comes to mind, with love and hate, laughter and tears. You can’t help but go back in time to when you courted your mate and when you had your first child. You put your feet in their shoes feeling everything they went through. I love this How I enjoyed this book called After Forever Ends by Melodie Ramone. This is a story of love and life as we go through the days of Sylvia, Oliver and Alexander. All the ups and downs of their journey bring you back to your courtship days and family ties. Family comes to mind, with love and hate, laughter and tears. You can’t help but go back in time to when you courted your mate and when you had your first child. You put your feet in their shoes feeling everything they went through. I love this quote out of the book: We were young. Love had a way of making us fearless because we knew that no matter what happened, if we fell on our face as we entered the ring or conquered the world in battle, in the end it would just be us, together. I love this quote from the book also: Some people you meet and they’re your friend for a day. Some you meet and you never really know at all. And then there are those who get caught inside your soul and stay there forever. I love this quote from the book also: Death feels cold to the living, but to those he is receiving, he has gentle hands, because of the magic of Love, when Death comes for you. Isn’t that the way it is. You start with your mate, have children and in the end it is just the two of you again until it is time for death. Read this book and enjoy the roller coaster of life these three went through. Than after you have laughed and cried, make your own story. Thank you Melodie Ramone for this lovely book. Oh by the way don’t forget your box of Kleenex. I have once heard of a quotation saying that while ordinary people live only once, a reader lives many a lifetimes. I never really grasped the true meaning of this statement before this book. After reading it I feel like I have lived an entire lifetime. I have lived, laughed, loved and cried along with the characters in this book that felt so real that I actually miss them now. The author writes the book in first person as Silvia a very engaging and interesting protagonist. This is her story her I have once heard of a quotation saying that while ordinary people live only once, a reader lives many a lifetimes. I never really grasped the true meaning of this statement before this book. After reading it I feel like I have lived an entire lifetime. I have lived, laughed, loved and cried along with the characters in this book that felt so real that I actually miss them now. The author writes the book in first person as Silvia a very engaging and interesting protagonist. This is her story her life, her love, her fears and her aspirations but even if it is her story the one that shines through it all is Oliver the love of her life. The thread that binds the story together is the pure and true love that they feel for each other. It is very rarely that you come across books of this quality that is able to convey the message without being preachy. That makes you question, after all what is enough to make life worth living. When Silvia first met Oliver she was a 15 year old girl without a mother and with an absentee father, A loner and a top grade student but everything changes for Silvia when she meets Oliver and his twin brother Alexander. Falling in love with Oliver and striking a friendship with Alexander Silvia changes from the lonely girl to a girl who is well loved and loves fiercely in return. She is accepted by a family who adores her and friends who would die for her. She gets married to Oliver and moves to a cottage in the middle of the woods with faeries watching over them and magic in the winds. As time goes Silvia becomes a wife, a mother, a friend, a sister, a grandmother and most of all a true companion to Oliver. She faces her own challenges and answers her own questions and finally finds the true happiness that only a very few are granted. This is a love story about Sil and Ollie. And Alex and Lucy. And all their kids and grandkids and their parents, too. But mostly, its about Sil and Ollie. Silvia is a teenager, sent to boarding school by her grieving father. She is immediately taken in by a group of friends, including twins, Oliver and Alexander. The story takes you through their lives from the time Silvia first meets Oliver, the love of her life, to Oliver's last breath at age 85, and there isn't a dull moment all through it. The This is a love story about Sil and Ollie. And Alex and Lucy. And all their kids and grandkids and their parents, too. But mostly, its about Sil and Ollie. The book chronicles Silvia's life, her anger at not knowing her mother, who died to young. Her anger at a father who didn't know how to parent two young girls after his wife, the love of his life died, and how Silvia felt he had let her down. It shows the way Oliver's family annexes Silvia as one of their own and the love she finally finds, the family she finally feels part of, and the family she creates with Oliver. It's about arguments and reconciliations, coming to terms with dead and dying parents and accepting that life isn't always what it appears to be on the surface. A brilliant, in-depth, three-dimensional look at different views on the same life event that every person should stop to consider when they are lost in their own throes of personal loss or pain. I saw the reviews on this and hesitated because of all the emotional content, which made it sound like a Nicholas Sparks novel, and yet I felt compelled to read this debut novel and I was not disappointed. The story is heart-warming, heart-wrenching, life-affirming and there isn't a woman alive who won't identify with someone somewhere through the course of this book. It's about relationships and life stages. I laughed, I cried, I wanted my daughter to read it, I wanted my mother to read it, I wanted my sisters to read it. 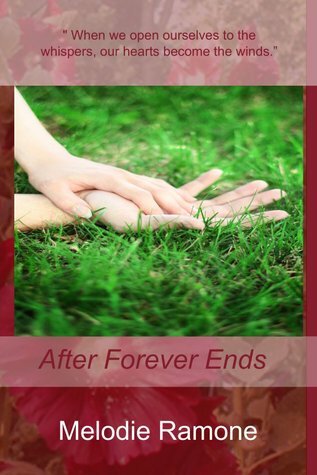 “After Forever Ends” by Melodie Ramone is an absolutely charming and enchanting love story. Told by Silvia, an old widow it is the tale of her love to her husband Oliver, whom she meets at the age of 15 and whom she loves ever since. Their wonderful, sweet, honest, romantic and deep love for each other crosses the paths of a few other significant people, not least Oliver’s twin brother Alexander and Silvia’s sister Lucy. This is the story of their life in Wales, their struggles and their ‘forever “After Forever Ends” by Melodie Ramone is an absolutely charming and enchanting love story. Told by Silvia, an old widow it is the tale of her love to her husband Oliver, whom she meets at the age of 15 and whom she loves ever since. Their wonderful, sweet, honest, romantic and deep love for each other crosses the paths of a few other significant people, not least Oliver’s twin brother Alexander and Silvia’s sister Lucy. This is the story of their life in Wales, their struggles and their ‘forever’. The book is written in a most enchanting style and leads us through the stages of the couple’s life in wonderful detail, thoughtful, humorous, inspiring and heart-warming. I can’t stress enough just how beautiful this book is without crossing the line into unnecessary drama or kitsch. The romance is heart-felt, realistic and magic at the same time as Ramone has created very likeable characters that are not always totally perfect but are trying to be. Although the book begins with Silvia at an old age and being widowed it ends on a positive note and left me happy and cheerful. It is a credit to this author to have handled the sadness as well as this and bring happiness to a time when forever has ended. I am massively impressed with this effort and urge you to see for yourself how lovely this book is. Wow wow wow..beautiful story, beautifully told. Melodie Ramone is truly a very talented author and I can't believe this is her first published book! I have read so many books, but none have touched me as deeply as this one. I see myself reading it over and over again. I have gone through so many emotions as I've read this book, nostalgia, sadness, happiness. I have cried and I have laughed. But I have mostly felt that life should be lived to the fullest. I too want to look back one day and have wo Wow wow wow..beautiful story, beautifully told. Melodie Ramone is truly a very talented author and I can't believe this is her first published book! "After Forever Ends” is this sort of the stories that are fitting with no particular genre but just pull you into their world and wouldn’t let you go. They grab you most firmly and take you along on their journey regardless of your original intentions. That’s how I felt reading this book - taken into someone’s life, kindly and warmly, so that I felt completely at home, not a nosy outsider peeking into someone’s life but a part of it, invited to learn all I wished about those amazing, interesting "After Forever Ends” is this sort of the stories that are fitting with no particular genre but just pull you into their world and wouldn’t let you go. They grab you most firmly and take you along on their journey regardless of your original intentions. That’s how I felt reading this book - taken into someone’s life, kindly and warmly, so that I felt completely at home, not a nosy outsider peeking into someone’s life but a part of it, invited to learn all I wished about those amazing, interesting, fascinating people. The story of Silvia and Oliver, Sil and Olli, is magical. It’s a story of a perfect love. “I love you, Just Silvia Cotton” goes strongly through the book, like a perfect accord in a beautiful symphony. From the very beginning you care for those two, you worry about them, you laugh with them and you share their frustrations. And Alex, oh Alex is Alex. He is a law in himself. I could go on and on about this trio but I’m risking to spoil the story for those who haven’t read it yet. In the end of this book I felt such gamut of emotions. Smiling, sad, emptied and drained, not entirely happy with the fact that the story has ended at all. This cabin in the woods of Wales, the fairy circle sprinkled with magic, the real magic and the magic of pure love, all those left me wanting to stay inside, to feel regretful that this particular journey has ended. I would highly recommend this read just to anyone. It has no genre and it doesn't need one. Wow, what a read. If I was stranded on a desert island and could only bring 5 books, After Forever Ends would be on my list. I love it that much. I could say it’s a story about growing up, family, love and the circle of life but that doesn’t do justice to the magic contained within the pages. It made me howl with laughter and later with tears and then with laughter again. The dialogue is as sharp as a knife and totally realistic as are all the characters. Sil, the main character, is strong, feis Wow, what a read. If I was stranded on a desert island and could only bring 5 books, After Forever Ends would be on my list. I love it that much. I could say it’s a story about growing up, family, love and the circle of life but that doesn’t do justice to the magic contained within the pages. It made me howl with laughter and later with tears and then with laughter again. The dialogue is as sharp as a knife and totally realistic as are all the characters. Sil, the main character, is strong, feisty, loveable and perfectly imperfect and I won’t forget her or the twins in a hurry. Set in a boarding school and later in a house in the woods, the locations are another huge plus for me. In a way it reminded me of ‘Anne of Green Gables’ (with bad language and more action! ), not that the story is any way similar just that book made me feel the same way after reading it. It makes me feel optimistic, reminds me of how beautiful nature is, how love is the only thing that really matters and to always look for the funny side to every situation. And it taught me that you have to feed the magic to see it work. I know this is a book, I will read over and over again. To sum up, you need to go read this book for yourself, you can thank me later! This book made me realize how simple love is. I wish i can find an oliver or even an alexander in my life. Will read it again if i'm sad or even if i'm happy. it celebrates love, life, family and friends. Made me cry throughout. After Forever Ends is one of those books that once you've read them, stay with you for a long time. And you'll go back, in time, to read a page or two here and there. Just because you don't want to forget what was that made you fall in love with the Dickinson brothers, the Cotton sisters and all the characters of a book that is very much like life is. Often beautiful, sometimes cruel but always, always magic. After Forever Ends is new favorite book of mine full of laughter, great characters and a wonderful story that flows smoothly from beginning to end. I loved this book especially Alexander. Who doesn't love the bad boy? But I want to go out into the world and find my Oliver now, too. I'm inspired that true love does exist and is not a fairy tale that no one can ever have. This book inspired me in a number of ways to see the world a little differently than I have. It makes you stop and look at your After Forever Ends is new favorite book of mine full of laughter, great characters and a wonderful story that flows smoothly from beginning to end. I loved this book especially Alexander. Who doesn't love the bad boy? But I want to go out into the world and find my Oliver now, too. I'm inspired that true love does exist and is not a fairy tale that no one can ever have. This book inspired me in a number of ways to see the world a little differently than I have. It makes you stop and look at your own life and think about your situation, but in a good way. You will laugh your head off during this book, but be sure to have a box of Kleenex handy too. I cried so hard at the end I got a headache. This book is a wonderful, bumpy ride! I love you, Silvia. I have always loved you. I loved you before forever began and I'll love you still after forever ends. The story is one of those typical boy girl happily ever after stories. But yet, it is so much more. Like the Goodreads synopsis says, its simple but extraordinary. This story makes you want to laugh along, smile, be mad, and cry like there's no tomorrow. This is the story of Oliver and Silvia. They were fifteen, fell crazily in love with each other, eloped away and got marri I love you, Silvia. I have always loved you. I loved you before forever began and I'll love you still after forever ends. The story is one of those typical boy girl happily ever after stories. But yet, it is so much more. Like the Goodreads synopsis says, its simple but extraordinary. This story makes you want to laugh along, smile, be mad, and cry like there's no tomorrow. This is the story of Oliver and Silvia. They were fifteen, fell crazily in love with each other, eloped away and got married at seventeen, had a dog(I forgot its name. There were just too many names to keep up with), made love in the garden outside their house ( I mean seriously), produced three cute babies, grew old, their babies' babies made babies making them great great grand parents before the end of the book. See? Typical. But there's just something about this story, something special, When you read this book, you will immediately be attached to the characters so when they go through many emotions in the story, you also cant help but feel those respective feelings. And that is why I cried out like crazy in the end. It was like I lost someone close to me. Seriously, you should have seen me, snot running everywhere, sobbing silently because I didnt want to wake up my sister. I woke up with swollen eyes. True story. Such a beautiful story!! I was literally living inside the story when I read it. I don't want to go back to my real life.... Hehe.. The twins, oh Oliver and Alexander, they are inseparable. It isn’t often that I gush over books in a teenage sort of way, but since the very first chapter, I’ve been telling every woman I know about how much I enjoyed reading it. It has been a long while since I’ve felt so thoroughly connected to a set of characters as I have been with Just Silvia Cotton and the Dickinson brothers. After Forever Ends traces the love story of two souls who share life’s journey in a way that is so authentic and powerful that it left me in tears and in stitches, often sim It isn’t often that I gush over books in a teenage sort of way, but since the very first chapter, I’ve been telling every woman I know about how much I enjoyed reading it. It has been a long while since I’ve felt so thoroughly connected to a set of characters as I have been with Just Silvia Cotton and the Dickinson brothers. After Forever Ends traces the love story of two souls who share life’s journey in a way that is so authentic and powerful that it left me in tears and in stitches, often simultaneously throughout the book. There were no climatic, edge-of-your-seat sort of moments, but instead the author carefully wove the beautiful tapestry of Silvia’s life with such grace and purpose that I can almost imagine that she is real. I grew as she grew. I felt what she felt. I learned about the moving and sometimes painful truths that only time can teach as she experienced them. There were so many carefully written segments and one of my favorite came toward the end of the novel as Silvia began the process of reflecting on her life, something that each of us will do in our own time. I know that I will still be thinking about this book for a long time to come. I recommend it to anyone who enjoys great literature and a beautiful love story. One of the best reads ever! One of the best books I've read in awhile! I laughed and I cried and I am depressed I finished the book and I am having anxiety about what to read next. What else? Well, I’m funny and quick tempered, older than I look and young enough to be able to fall on roller skates and still mo I'm a wife, mother, keeper of fuzzy critters, author, speaker and certified Kitchen Witch. When I'm not creating Culinary magic, I can usually be found writing stories, reading books, relentlessly tweeting, knitting or delving into fringe Physics. Super geek? Oh, yeah.